Let's get this straight, ghosts are everywhere. I can see them. You can't. And, see them or not, they're dangerous. This is why my family has hunted ghosts for hundreds of years to protect people like you. The Marin family are outcasts of the ghost hunting world. They run a two man operation in inner city Melbourne. Anton has the Ghost sight, but his father does not. Rani Cross is supremely skilled in hand to hand combat, with enhanced speed and strength thanks to her magical initiation into the Company of the Righteous. When it comes to ghost hunting methodology, Anton and Rani don't see eye to eye, Anton likes to ease their passage to the next world, while Rani's all about the slashing. 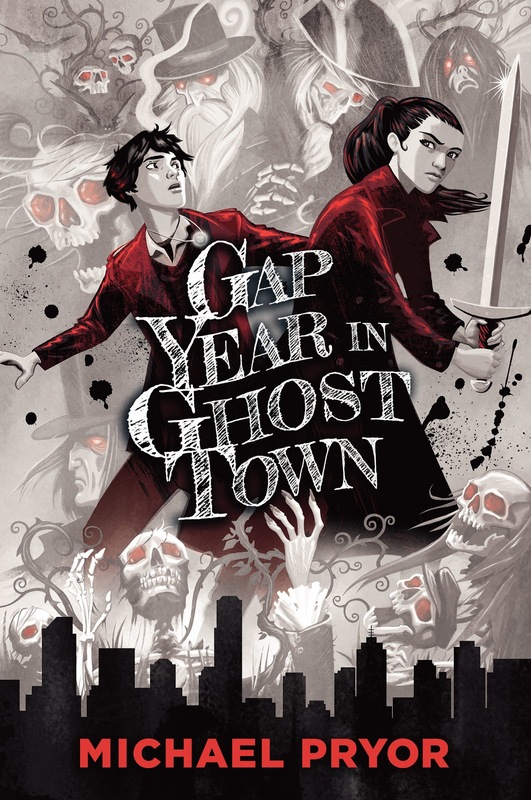 But Melbourne is under threat, with a massive spike in violent ghost manifestations, Anton and Rani must find a way to work together to keep supernatural forces at bay. Throughout the quiet, darkened streets of Melbourne, eighteen year old Anton Marin searches for ghosts, delicately releasing their spirits from Earth by easing their passage. Anton is a delightfully charming young man who is reluctantly pursuing paranormal investigation to appease his father. The Marin spectre legacy now falls upon Anton, the Sight ability escaping his father who documents each encounter, maintaining the Marin archives from a hidden retreat in the family owned bookstore. Rani Cross is a graduating member of the Company of The Righteous, a prosperous organisation abundant in tradition, emigrating from London with her foster parents, Company of The Righteous employees. The Company of The Righteous believes in the disposing of spirits through violent methods, disciplined soldiers instructed in weaponed combat and Rani is conflicted by Anton's gentle approach. Gap Year In Ghost Town is magnificent. Melbourne provides an affluent Victorian landscape of ghostly apparitions, Weepers, Moaners, Lingerers and ghosts who manifest as Ragers. Anton and Rani begin to investigate the increase in spectre apparitions when they discover a slain body and a grieving widow summoning Rogue spirits. Readers will appreciate Anton and Rani's tentative and platonic friendship, Anton and friend Rebecca and in addendum, Rebecca and Rani. Facile and charming. Anton's relationship with his father was lovely, a wonderful presence who challenged Anton. Anton's father is a fascinating character who continues to mourn his the death of his youngest child, his marriage and his sister's disappearance. From the city to the suburbs of Melbourne was enchanting and atmospheric. As Anton accompanied Rani throughout the city and her suburbs, I was fascinated by the history of Melbourne folklore. Readers will appreciate the diverse Australian characters and Rani, who although from Britain is of Assamese, Chinese and Malaysian heritage. 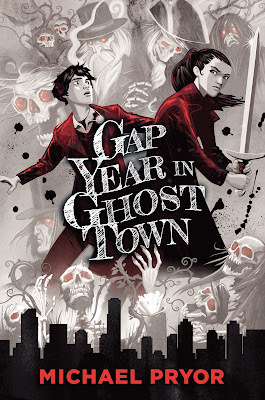 Theatrical and charismatic, Gap Year In Ghost Town is wonderfully written with humour and finesse. Simply brilliant. It's perfect for fans of Supernatural Tasya. The friendships are wonderful, uncomplicated and supportive. I really enjoyed it. I'm so chuffed this is in Melbourne and explores it's lore and stories. I note you used 'platonic' -- that's brilliant, it's focusing on their friendship and not a romance. It's so refreshing isn't it Verushka! Another aspect I really enjoyed was the characters ages. Although technically adults, it's still suitable for mature middle grade and young adult readers. The next bogan review will be for Tower of Dawn by Sarah J Maas, it's currently in the works. I suspect a lot of readers might have preferred a romance thrown in there but it was so refreshing to see male / female platonic friendships not clouded by instant love. romance smooomance, can't a bunch of kids be friends? That cover is gorgeous! and I love the sound of this book - especially the friendships. It's marvellous Karen! Such a wonderful read, highly entertaining. I love that cover so much and the book sounds fabulous. Can I just say how much I like the sound of that platonic friendship?? I need to check out the book, Kelly! It's brilliant Nick! I don't think it's available outside of Australia but you could probably pick up a Kindle copy or order from The Book Depository. And the author has confirmed it will be a series! Hooray! Victorian setting plus ghosts? Yeah, I'm sold. Definitely sold. I love ghosty books, and I'm so happy to hear that there's no forced romance in this book. Awesome review! Thanks Erin. Such a wonderful read and suitable for both mature middle grade and young adult readers as well. Would love to see what you think of it. Oh this sounds cool! So then no romance involved? Even better. It was brilliant Christy. So entertaining and hilarious. I have a feeling a romance may develop in later instalments but definitely no instant love. So refreshing. It was! And I asked Michael Pryor and there are more adventures to come! I'm really excited for a series! This sounds like a really interesting read and it sounds fun! I will check it out if I get a chance but it definitely seems it's targeted for a younger audience than I'm used to see so I'll try and remember that if I get a chance to pick it up. It would be perfect for mature middle grade and young adult readers, even adults will be highly entertained by the sass and humour. I could honestly imagine this becoming a television series. The new Buffy meets Supernatural. There aren't too many among popular young adult is there, ones I've found are usually horror. It's a brilliant read Vanessa, definitely one to add to your list. You definitely won't be disappointed Sarah, can't wait to see what you think of it. AHA this honestly sounds like the best! I haven't yet had the chance to read it but I am so excited to after knowing that it's set in Melbourne! Lovely review Kelly! I think you'll really enjoy this one Anisha, it's so brilliantly funny. It's brilliant Haniya, superbly entertaining. Oh, I haven't heard of this one but it sounds amazing! Thanks so much for sharing - I need to add this to my to-read list. Great time of the year (where I live) for this one!! LOVE the cover too. Just gorgeous. Ooh yes, perfect for Halloween Lauren! Amazon Australia should have Kindle copies or even The Book Depository for quick, free shipping. Such a wonderful read. I originally thought this was Middlegrade because of the cover, so was surprised to discover it's actually YA. This sounds charming and full of character, it's now on my TBR!